Already, we see how a day of intense rain causes havoc with flooding. The inexorable march of climate change is bringing more intense rain at odd times or no rain at all. The ‘heat island’ effect of cities with bumper-to-bumper traffic jostling for space with humans gets accentuated during times of no rain. The importance of managing water holistically is becoming more than ever before with growing urbanisation. Flood risk management has to be integrated with land use planning in cities; there is no other way forward. Tony Wong, Chief Executive Officer of the Centre for Water Sensitive Cities, Monash University pointed out during the Water Leaders Summit in Singapore that urban water systems need to move away from focusing only on single objectives such as water supply or wastewater disposal (taps and toilets). Instead, they must transform by design into multiple-objective, flexible systems that integrate various sources of water, operate through a combination of centralised and decentralised systems and deliver a wide range of services to communities. Planners focussing on merely diverting water from more distant rivers or engineers designing treatment plants and distribution systems are not helping urban residents to ward off the next big flood or scalding summer. An example of a multi-objective response to stormwater management could be the ‘riparian sponge concept’. The excess run-off caused by urban development could be detained and evapotranspired by vegetation and media acting like a sponge. Wetlands, environmental buffer zones and other “urban greening” measures not only reduce ﬂood impacts, but offer so many other beneﬁts such as reducing the urban heat island effect (by increasing evapotranspiration) and creating a healthier urban space. In the city of Cordoba, Argentina, buffer areas around the Primero River improved the urban environment and removed residents at risk to safer locations. According to Professor Wong, stormwater harvesting combined with filtration, infiltration and irrigation can reduce run-off volumes to pre-development levels. Pollutant loads in run-off can be reduced to levels appropriate to receiving waters. Rainwater harvesting can be applied not just for water conservation but for flood prevention. 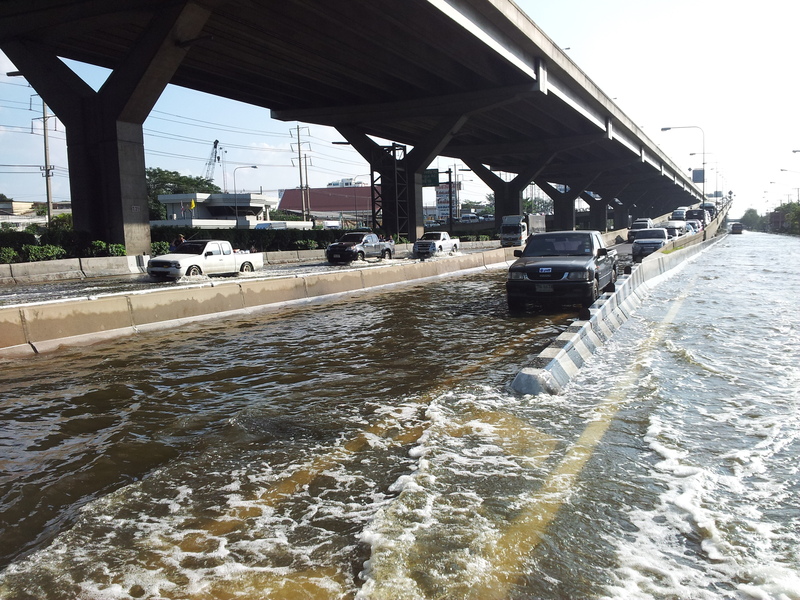 Groundwater management can be applied to reduce subsidence-induced failure of buildings as well as mitigate flood risk, which is being attempted in Bangkok. By 2025, the numbers of urban Asians at risk of coastal flooding and inland flooding are projected to be 400 million and 350 million respectively by Asian Development Bank. What Bangkok experienced last year (and the waters have not fully receded even now) was an example of inland flooding while the Netherlands usually faces coastal flooding. Heavily populated cities such as Dhaka, Ho Chi Minh City and Tianjin are vulnerable to both coastal and inland flooding. It is not too late for city mayors and provincial leaders to start looking at the water cycle of cities as a whole.